The moment I saw the illustration for this oversized pullover I knew I wanted to sew myself one...or two...or a dozen. I know it doesn't look like anything special. And it might not be, but I LIVE in big, comfy pullovers paired with yoga pants all winter long. Well, at least at home I do. I still have to dress professionally in the office :-) This top is perfect for my at-home winter attire. I picked up this lightweight terry knit (with a hint of sparkle!) at Hobby Lobby a few weeks ago with the intent of trying out this pattern. It's soft, so the shape of the collar and sleeves are not apparent. And the metallic thread makes it a wee bit scratchy at the collar, but I don't care. I have to tell you - this top is soooooo big! I know, I know. The signs were all there. The pattern description says “very loose-fitting” and I could have paid attention to the measurements printed on the pattern pieces. But I didn't. Instead I cut my usual size, ignoring the amount of design ease. There is a silver lining though as I didn't have to do a FBA! The collar! It’s my favorite part. It’s cut with the grain, which meant the stretch of the fabric does not go width wise on the collar. I thought it might be a mistake as I was placing the pattern pieces on the fabric, but I think that might be how the collar stands up so nicely! Another cool design feature is the side panel that is sewn to the front and back of both the body and the sleeve. I was curious why the pattern description said “sleeve in three pieces” and now I understand. I think that panel could make for interesting colorblocking. For example, I was thinking of sewing the top out of a Ponte Knit and using a faux stretch leather for the contrast panel. This one was my test top. 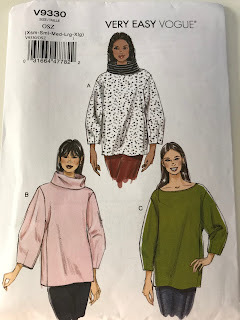 Now that I know what I'll do differently, I’ll be keeping my eyes open for the perfect fabric for my new (dozen) stay-at-home pullover top(s). Before I leave, here's a pic of the pattern envelope and a link to the Vogue website where the pattern can be purchased. I have a problem believing the measurements on the front pattern piece. I need to be more trusting. I like It! I agree regarding the sleeves. I think I will try it gathered into a cuff. That would echo the collar and be quite chic and practical. The line drawing looks like a tunic length which I prefer. Did you shorten it? I'm impressed with that 3 piece sleeve construction and I agree with the color blocking idea. Elegant. You look so darn cute ! This is a top you'll live in this winter!